Home Improvement Tips & Tricks: Staircase Makeover - The Ups & Downs! Home Improvement Tips & Tricks: Staircase Makeover – The Ups & Downs! When you think home improvement projects, I doubt that the first element of your home that comes to mind is your staircase. However, when made over, this commonly overlooked component of your home can make a big difference in its aesthetic appeal. Plus, most staircase makeovers can be remodeled on a budget, and sometimes in a weekend! To start, first consider these key factors: how much time & money do you want to spend, and how ambitious do you want to get. 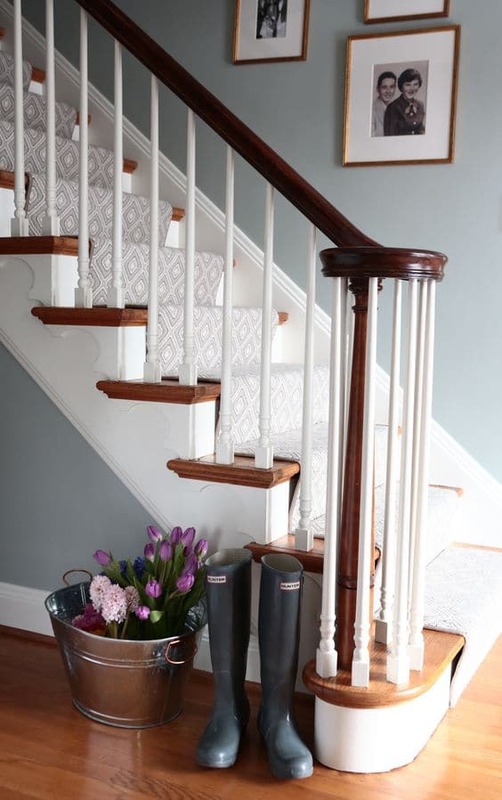 Some staircase makeovers can be as easy as adding a fresh coat of paint, while others take a little more time. Secondly, consider the location of your staircase—is it a central fixture in your home that is seen by many, or is it more hidden towards the back of your home. Whichever direction you decide to go (pun intended) here are some tips & tricks that will help along the way! 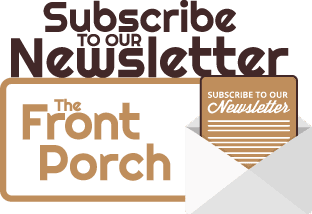 I’ve said this before, and I’ll say it again, a fresh coat of paint goes a long way and can make a world of difference, especially when it comes to this home improvement project! If you’re fortunate enough to have a wood staircase, or wooden stairs hidden under the carpet, use it your advantage. With that in mind, don’t settle for ordinary and boring! Now, I’m not saying to paint your staircase some outlandish color, but I am saying to utilize multiple colors. Consider painting the risers and trim one uniform color, i.e. white, cream, and staining the treads a darker color. Doing so will spruce up your steps, and give your staircase more depth. If you have a wooden handrail, too, stain it the same color as done to the treads for a complete, cohesive look. If you opt to keep the carpet or prefer a carpeted staircase, we recommend a good deep cleaning to rid any unwanted stains. 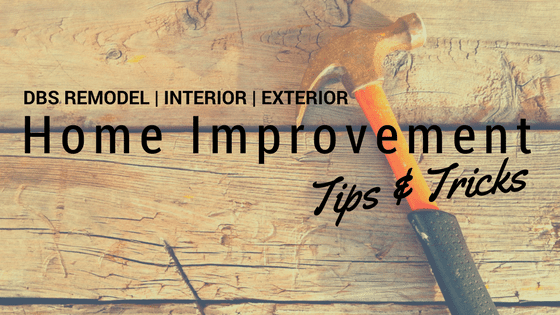 But, just because you want to keep the carpet, doesn’t mean there are no home improvement projects to be had! Consider painting the balusters & railings of your staircase, or changing out the balusters all together to wrought iron ones. Wrought iron balusters will instantly update the look of your staircase and home. You can also install DIY wainscoting for a more classic style. There are several methods to adding wainscoting to your staircase, it just simply depends on how ambitious you want to be. Now maybe you have a wooden staircase that is stained and painted to perfection, but it still lacks visual appeal. Consider installing a stair runner. No, not the runners you’d see at your grandmother house, modern runners! Runners with a contemporary design can add much-needed flair to your staircase, while also pulling together colors & accents of your home or room (i.e. foyer or living room.) Runners can easily & effectively add color & style to your steps! Lastly, regardless of location, most staircases allot for a gallery wall, so benefit from its blanket canvas, and choose some of your favorite images to display. Keep certain elements of your gallery wall uniform (i.e. all photos being in black & white, theme, etc.) and play with the frames. Your gallery wall can be uniform in its entirety or a combination of frames & shapes. Don’t be afraid to add in wall art as well, such as decorative mirrors, letters, or sayings. Cohesion is key! Check out these gallery wall layouts for your staircase! A staircase makeover can have its ups & downs (I can’t help the puns) but will pay off in the long run! Consider the style & look you want to achieve and how much time, money, & energy you want to put in, and in the end, you’ll have a stairway to heaven!